[Pages 258-259] - That afternoon the first Vietcong soldier was taken to a treatment room in the compound and strapped to a table. Using a Page-Russell electroshock machine they had brought with them, the Agency doctors gave the man six separate electroshocks. Twelve hours later he received a further series of multiple shocks. Within a week Dr. (Lloyd) Cotter began to see "evident improvement in the behavior of the patients." He was convinced that this was "a result of their dislike or fear of ECT." In the compound, the Agency psychiatrists continued their work. They were trying to establish whether Dr. Cameron had been correct when he said depatterning could dramatically change a person's ideological views. The Vietcong prisoners had been chosen because they were what the Agency doctors classified as typical cases of Communist indoctrination. After seven days, when the first soldier had received a further sixty electroshocks, he died. Meanwhile, Dr. Cotter continued with what would be a busy summer, administering the "several thousand shock treatments as we started about one new ward a week on the program." After three week, the last Vietcong prisoner was dead. The Agency men packed away their machine and flew home. Their complete failure was a further proof that psychiatric technology would still not bend itself totally -- at least not to the will of the CIA. More difficult to separate was the dividing line between treatment and torture in what Dr. Cotter did. [Page 264] - Throughout 1968 Dr. Gottlieb continued to preside over his empire of scientists who still prowled the backwaters of the world seeking new roots and leaves that could be crushed and mixed in the search for lethal ways to kill. In their behavior laboratories the psychiatrists and psychologists continued experimenting. Once more they turned back on an earlier line of research -- implanting electrodes in the brain. They had done that with animals in the early 1960s, using radio signals to manipulate the chimpanzees into fighting and even killing each other. But no one had then been prepared to go further. Vietnam, with its almost endless supply of expendables, made it possible to see whether such control could be reproduced in humans. An Agency team flew to Saigon in July 1968. Among them was a neurosurgeon and a neurologist. Their basic research had been conducted on animals at another CIA front organization, the Scientific Engineering Institute near Boston. It had been founded in 1956 under the presidency of Polaroid's Dr. Edwin Land. In a closed-off compound at Bien Hoa Hospital, the Agency team set to work with three Vietcong prisoners who had been selected by the local station. Each man was anesthetized and the neurosurgeon, after he had hinged back a flap in their skulls, implanted tine electrodes in each brain. When the prisoners regained consciousness, the behaviorists set to work. The prisoners were placed in a room and given knives. Pressing the control buttons on their handsets, the behaviorists tried to arouse their subjects to violence. Nothing happened. - For a whole week the doctors tried to make the men attack each other. Baffled at their lack of success, the team flew back to Washington. As previously arranged in the case of failure, while the physicians were still in the air the prisoners were shot by Green Beret troopers and their bodies burned. [Pages 274-275] - By early 1972, Operation Often had taken on two more palmists, both Chinese-Americans, to probe still further how hand-reading could be adapted to intelligence work. The Agency behaviorists already knew that different cultures produced varying personalities. Each society had a particular vision of masculinity and femininity, of rights and obligations. The question the palmists were asked to answer was how much of this could be discerned from palm lines. The hand-readers set to work. Posing as educational psychologists, they visited a number of ethnically variable communities, traveling north to Alaska to study Eskimos and south to New Mexico to look at the hands of Indians. While they were about their business, Operation Often went deeper, into demonology. In April 1972, an oblique approach was made to the monsignor in charge of exorcisms for the Catholic archdiocese of New York. He flatly refused to cooperate. Undaunted, the Agency behaviorists approached Sybil Leek, a Houston sorceress, who cast spells with the help of a pet jackdaw called Hotfoot Jackson. With the bird perched on her shoulders, Mrs. Leek gave the "two very nice gen'l'men" from Washington a fast course on the current state of black magic in the United States; four hundred regular covens operated by five thousand initiated witches and warlocks, who formed the low-profile apex of a prediction industry that supported 10,000 full-time fortune-tellers and 200,000 part-timers, as well as a growing publishing business in tarot cards and factories that produced a widening range of anti-Christian tokens. Satan was not only alive, but thriving in the United States. To corner him for the Agency, it was recognized at Langley that the Devil must be made respectable. Working through conduits, the Scientific Engineering Institute helped fund a course in sorcery at the University of South Carolina. Two hundred and fifty students enrolled. The scientists of Operation Often studied carefully the results of classes devoted to fertility and initiation rites and raising the dead. Concurrent with those investigations, ORD had taken up the challenge of brain implants. The failure at the Bien Hoa Hospital in Saigon was rationalized: the team had been in too much of a hurry, and had worked under far from ideal conditions; the proximity of a full-scale war was not the place for such delicate experiments. Before setting up their own program, the ORD scientists evaluated the results achieved by Dr. Jose Delgado, a Yale psychologist. He had faced a charging bull, fitted with electrodes in its brain, and with no other protection save the small black box in his hands, Dr. Delgado had deliberately goaded the bull by activating the implant that provoked the animal to become further enraged. Then, with the bull almost upon him, the psychologist had pressed another button. The animal promptly stopped in its tracks, the result of a signal transmitted to the electrode implanted in the part of the bull's brain that calmed it. Dr. Delgado freely admitted that his method of remote mind control was still crude and not always predictable. But Dr. Gottlieb and the behaviorists of ORD shared the psychologist's vision that the day must come when the technique would be perfected for making not only animals, but humans respond to electrically transmitted commands. Dr. Robert G. Heath, a neurosurgeon at Tulane University, had brought that prospect closer through his experiments with electrical stimulation of the brain (ESB) to arouse his patients sexually. Dr. Heath had actually implanted 125 electrodes in the brain and body of a single patient -- for which he claimed a world record -- and had spent hours stimulating the man's pleasure centers. Like Dr. Delgado, the neurosurgeon concluded that ESB could control memory, impulses, feelings, and could evoke hallucinations as well as fear and pleasure. It could literally manipulate the human will -- at will. 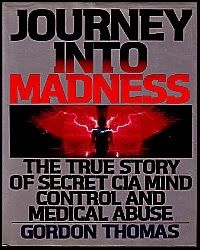 Late in June 1972, Dr. Gottlieb had jigged back and forth on the carpet of the director's office, and his carefully controlled stammer had surfaced as he enthused that at long, long last, here was the answer to mind control, that ESB was the key to creating not only a psychocivilized person but an entire psychocivilized society -- a world where every human thought, emotion, sensation, and desire could be actually controlled by electrical stimulation of the brain (Excerpts from the book Journey Into Madness, The True Story of Secret CIA Mind Control and Medical Abuse by Gordon Thomas).